Here is the full review of Blitzwolf BW-P6 Power Bank. This Blitzwolf power bank comes with 10000 mAH capacity and Qualcomm Quick Charge 3.0 input. Read this full article to know how much fast this power bank and how good is it considering the price. The packaging of this power bank is quite good with small and solid white box. On the top, we get user manual, warranty card and micro USB cable. I request you read the user manual before using this power bank. More information please watch my unboxing & review video of this power bank. On the design front, the Blitzwolf BW-P6 adorns a very sleek and stylish profile. Because of its slim and compact design, you can easily store this power bank in your pocket. Another best part is that its very lightweight, only 208g. The dimension of Blitzwolf BW-P6 is just 2.6 inches wide, 5.4 inches long, and 0.6 inches of depth. The finishing of this power bank is really good. Except for the build, it feels like a smartphone made of plastic. The power bank is made of ABS plastic but I am not very impressed with build quality. Compared to the price, the build quality is not so good. It could have better than this. On the front side, you will notice Blitzwolf branding and four blue LED indicator lights on the bottom side. with each LED corresponding to a 25% charge. More info please read the user manual. The Blitzwolf BW-P6 automatically switches on and off as soon as you connect a smartphone, but there’s a dedicated power button on the right side as well. A peek at the top and you will notice two USB ports. Yes, this power bank supports simultaneous dual charging. The green colour USB port support Max 5V/3.0A output, which means it supports Qualcomm quick charge 3.0 fast charging. If your phone does not support Qualcomm quick charge 3.0, then don’t worry the power bank also compatible with QC 2.0, Samsung AFC and Apple fast charging with 9V/2A and 12V/1.5A output. The second USB charging port support 5V/2.4A output, which is also a kind of fast charging. Apart from that, there is an also fast charging micro USB port (5-9V/2.1A) to charge the power bank itself. 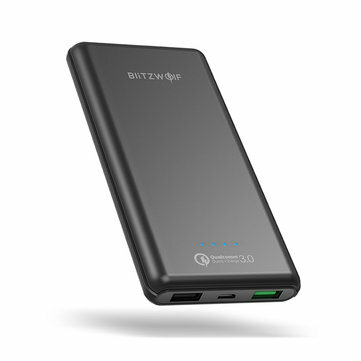 The 10000 mAH Blitzwolf BW-P6 power bank top up your phone multiple times, depending on your smartphone battery. It gives approx 5800 mAH to 6000 mAH capacity out of the full capacity of 10000 mAH, which means it can charge your 2500 mAH battery powered phone for approx 2.3 times. And this is the average capacity, which we can expect from 10000 mAH power banks. Please note, power lost during voltage conversion is a common problem in power banks, so don’t expect full capacity in any power bank. Now coming to charging time, the Blitzwolf BW-P6 is very fast. The green colour USB port support 5V/3.0A, so it can charge your 3000 mAH battery powered phone within 50 min. If your phone supports Qualcomm quick charge 3.0. If your phone does not support QC 3.0, then it takes little bit more time. This power bank also supports fast charging 2.1A(5-9V) input. If you use an 18W/2.1A adapter to charge, then it takes only 3 to 4 hours in full charge. Please note, actual charging time depends on your wall adapter. The Blitzwolf BW-P6 also features multi-layer safety protection built in to prevent any kind of mishaps to your expensive smartphone. Including – short circuit, over power, over current and over voltage. The price is the only downside of this power bank. Currently, there are lots of other 10000mAH power banks available in Indian market at a cheaper rate. So I think it’s not a value for money deal to buy this power bank. But if your buying budget is high and you need a Qualcomm quick charge 3.0, then you can buy it. More information please check full review video on my youtube channel Geekman.